Melody Monroe is self-publishing a book with Outskirts Press, and she wants your help deciding her upcoming book cover. Pete Cluckington is a young chicken, who just moved away from a chicken farm to a farm with lots of different kinds of animals. Never being around other kinds of farm animals, not to mention his father’s beliefs about them, sets Pete up for a challenging adjustment. Even though he has a hard time adjusting to the diverse population of his new farm and his new school, deep in his heart, Pete wants to make friends with the other farm animals. But, can he? What will his dad say? Melody Monroe is a music teacher with National Board Certification in early to middle childhood music. She loves to celebrate diversity in her classroom and school. 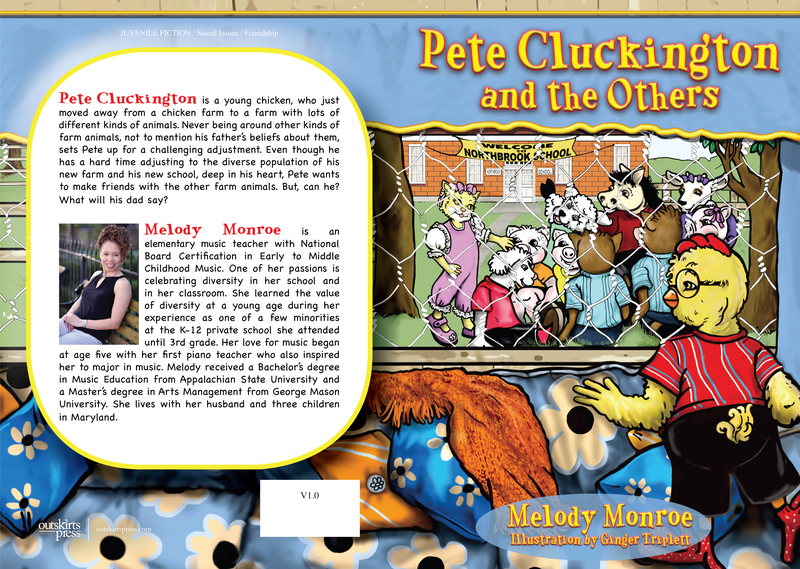 Her love for diversity and children helped inspire Pete Cluckington and the Others, her debut children’s book. She has a Bachelor’s degree in Music Education from Appalachian State University and a Master’s degree in Arts Management from George Mason University. Although born and raised in North Carolina, Melody currently lives in Maryland with her husband and three children. She enjoys teaching her students to sing, perform folk songs and dances from world cultures, read and create their own music, and of course, play Freeze Dance! She also loves going to the movies with her family and eating lots of buttered popcorn! Previous Previous post: Submit Your Book for Award Season and Save 15%!